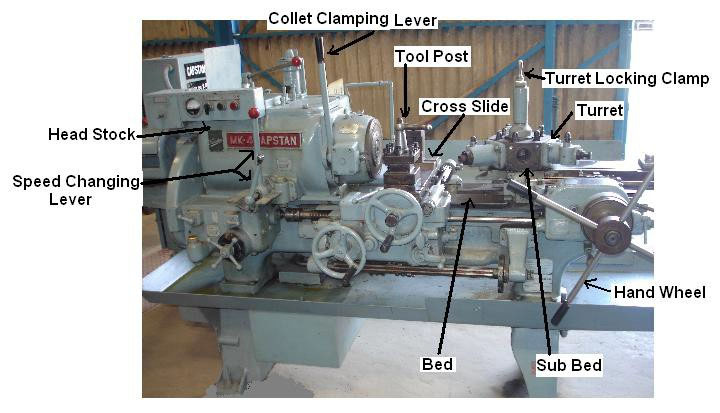 A capstan or a turret lathe is a production lathe used to manufacture number of identical pieces in the minimum time. These lathes are development of engine lathes. The capstan lathe was first developed in the United States of America by Pratt and Whitney in 1860. Capstan lathes employed for machining small parts are similar to turret lathes, except that the turret slides moves on an auxiliary slide. Turret lathe, designed for small and continuous production, have turret head in place of tail stock of the center lathe to carry end-working tools and an indexable square tool post on the cross slide for mounting the turning tools. This type of arrangement facilitates to hold number of tools at a time. These tools can be utilized as per the sequence of operation without wasting the time in setting of tools for each operation. Capstan and turret lathe are used for mass production of identical parts in one set up. The increased rate of production can be obtained by saving the time lost in changing and setting of tools for new operations. In capstan and turret lathe job can be finished in single setting of tools and more than one tool can be employed simultaneously. These special characteristics of a capstan or turret lathe enables it to perform a series of operations such as turning, drilling, boring, thread cutting, reaming, necking, chamfering, cutting- off and many other operations in a regular sequence to produce a large number of identical pieces in a minimum time.